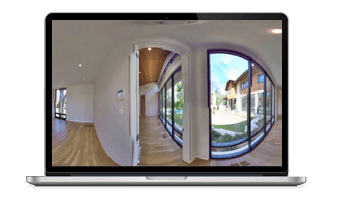 360 Interactive Panorama Tour - the new way to show the exterior & interior. Three-sixty degree (360°) photography and videography are one of the upcoming trends in the digital world. Thanks to technology, there are a lot of cameras that are able to shoot photo and video in a panoramic resolution, creating virtual tours to show properties and locations in a more exciting, thrilling and most importantly - realistic way. What Are 360° Interactive Panoramas & Where Are They Commonly Used? Ever since Facebook adopted this type of panoramas to the platform, the world went crazy for the new form of video known as 'a virtual tour'. This type of photography and videography definitely shaped the future of video and created a lot of possibilities. One of the most significant ones was the interaction with the video - something we could rarely see other than the Sci-Fi movies. In a nutshell, users can now see photos and videos in 360° and move their cursors to check out every angle of the location or property - left or right, up or down. This dynamic experience has been used a lot by real estate owners, luxury properties, golf clubs, art galleries and basically businesses that want to showcase their locations or services in a different and more realistic way on the screens of their followers. Possibility of 360 degree view gives you an excellent understanding of the place, building or property. This feature makes it possible to link the panorama with various events or transitions. Related events or references may appear in the panorama or opened on another page. Panoramas can be linked to floor plans and a Google map. In panoramas is possible to insert any kind of content - videos, music, photos & web. Panoramas and related content are displayed correctly on the screen of any device. 360° interactive panoramas let individuals and businesses to reap the rewards of the new type of visual experience that not only fascinates people, but is guaranteed to convert them. Intuitive, high-end and rich, the panoramic virtual tours are crafted to impress. Since the 360° interactive panorama is actually an interactive type, it doesn't only limit the viewer to viewing the video. Instead, if gives him an opportunity to make decisions, see the things he wants to see and basically interact in a whole new way. And that is what makes 360° panoramic virtual tours so special. From Google Street View to Facebook, the use of 360° panoramic videos has been adopted by high-end platforms. However, it's time for businesses to benefit from it as well, re-creating their videos into brand new experiences that involve and engage their customers on a different level. Instead of static photography and traditional video, 360° interactive panoramas can be the single thing that sells more than the image of your brand and a format that presents information in the clearest way possible. The sphere-like technology that shoots photos and images like these is still hard to find. Fortunately, 360° interactive panoramas can be done professionally with a company or business specializing in them. At Dubai Iceberg, we pride ourselves on being one of the early movers in this technology, letting businesses of all sizes and types to benefit from it. Are you one of them and want to hear more about how 360° interactive panoramas can help you? Contact us now and see the benefits! Example 2 Example 1 These examples show the possibility of using different content in panoramas. Affordable video options for any kind of business.